What a beautiful quilt! Helen Weinman designed this beauty for The Quilter Magazine earlier this year. She makes inspired use of batiks in this design to evoke a Van Gogh-like feel. As with their other free patterns (see below! ), The Quilter Magazine has done a wonderful job on the pattern itself, with very clear instructions, illustrations and photos. The quilt pictured was quilted by Cathy Franks. 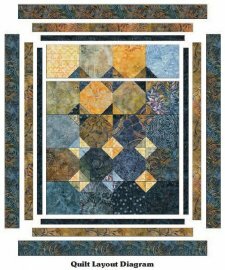 The Quilter's Mag has also put together a great collection of images and sites with free patterns available on their Pinterest page, give it a look. Check out Helen's site, Heartbeat Quilts. 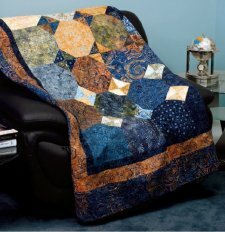 Helen is closing her store and has quilts listed at 25% off and kits at up to 40% off. Don't miss it!